Welcome to my very special review of the Pilot episode of Young Sheldon, the spinoff of the Big Bang Theory. I've been a Big Bang Theory fan for as long as I can remember, and I'm really excited for the spinoff. I'll only be reviewing the Pilot for now, but that doesn't mean there isn't a possibility that there be any additional Young Sheldon reviews down the road. The episode begins with Sheldon playing with his train set when his Mom calls him to dinner. He need to wear mittens to pray, because he doesn't want to have to touch anyone else. Mary wants someone to go to church with her, and Sheldon volunteers. Sheldon's sister Missy is forced into going. She is not happy about that. At church, Sheldon is talking during the sermon, and he asks Mary when he should be "expecting his testicles." This upsets the woman in front of him, which causes Mary to tell the lady off. At home, Mary wants Sheldon to enjoy the last day of Summer, but he wants to learn the Student Handbook. While he is "playing", he runs into the local bully, and he runs away. The next morning, Sheldon can't find his bowtie. Mary tries to help him find it, and she thinks George Jr stole it. While searching Jr's room, George Sr tells her that he took it. He initially won't give it back, but Mary is scary so she gets it back for her son. At school, Mary wants Sheldon to get rid of the bowtie, and she even promises a trip to Radioshack(!!!!) in return. He takes off his bowtie, and they head inside. Sheldon heads to his homeroom, and Mary starts crying. Sheldon walks in, and almost immediately insults his teacher. He also humiliates George Jr. Sheldon's teachers are all really upset by how he acted. Mary defends Sheldon, and when the Principal asks George Sr for some help, he refuses (again, his wife is scary!). At football, George Jr gets in a fight with someone that calls him the dumb brother, and he decides to quit. George Sr tells him not to get bothered by Sheldon. At home, George Sr wants to talk with Sheldon. He tells Sheldon to stop ratting people out, and that he got fired for doing something similar. At dinner, Sheldon holds his father's hand without his mittens, for the very first time. The next day, Mary takes Sheldon to RadioShack (which will be there forever). This was an enjoyable Pilot, and it was very touching and heartwarming. It wasn't LOL funny, but I still liked it. Iain Armitage was great as Sheldon, but the person I enjoyed the most was Zoe Perry as Mary. She was great, and so believable, in the role. And it's understandable. Her mom, Laurie Metcalf, originated the role on the parent series. Since Metcalf couldn't work in this role, Perry was the next-best thing, and she was perfect. I'm excited to see more of the series, and to see where else it will go, since this show really has so much potential. You already know how I felt about the show, but what did you think? Let me know in the comments and vote in the poll below! 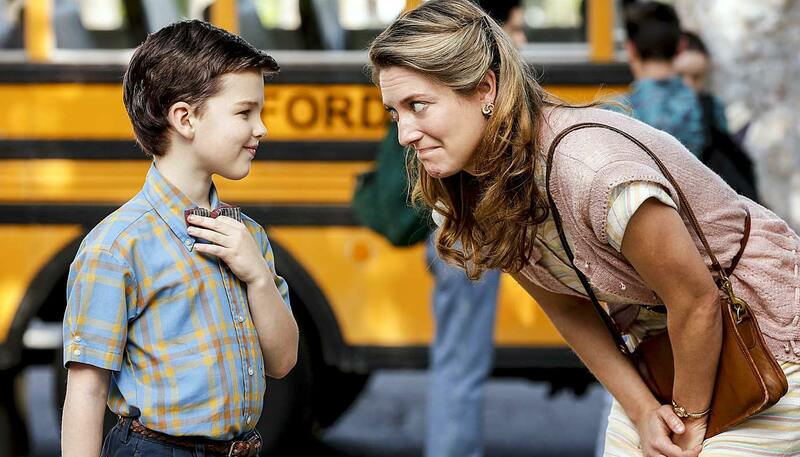 What grade do you give the Pilot of 'Young Sheldon'?